Spread the cost from only £84.94 a month with Interest Free Credit. Heal's Designed by You collection of dining tables and benches allows you to create the perfect table for your space. 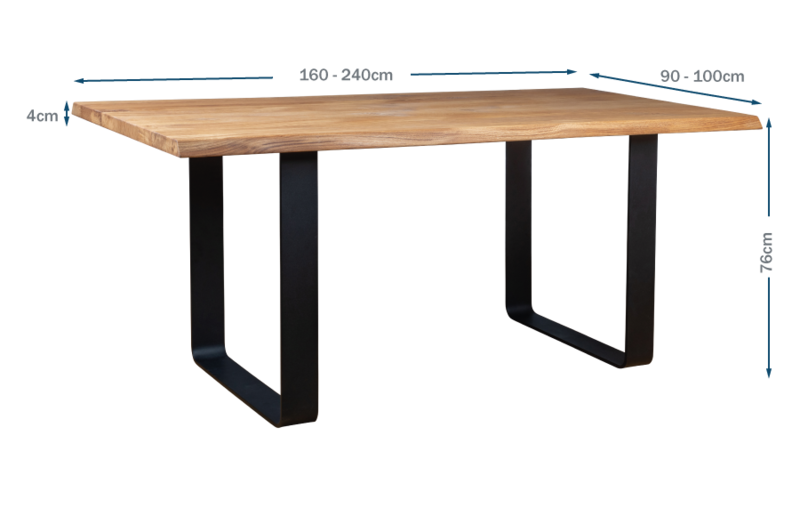 Our tables are made of solid oak or walnut in an oiled finish and are available in five lengths, two widths, and six different wood finishes and three different edge profiles to create a table that is the perfect fit for your home. Grain, knots and cracks are a natural property of all solid wood and add beauty and interest. Each piece is unique and will have a different grain pattern and variances in shading and colour. This is the charm of solid wood and is a different look to veneers which are more uniform. The oiled finish will enable the table to last a lifetime with a little love & care. The Prague table has a wide metal leg frame giving a modern industrial look, perfect for a contemporary setting. Oiled finish made to last with a little love and care. Choose 'Not Filled' to see the natural knots and cracks, or 'Filled' for a beautiful smooth surface. All light oils come with transparent filler and dark oils (including walnut) come with black. Shown with solid oak top, also available in solid walnut. The tables wide metal leg creates a modern industrial look. Shown in natural edge profile for a more rustic feel, straight or chamfered edge also available. Available in 6 oiled finishes. Available with 3 edge profiles. For best results oil periodically with a lint free cloth to protect the surface and maintain the tables beautiful natural look. The metal legs can be cleaned using a damp cloth.